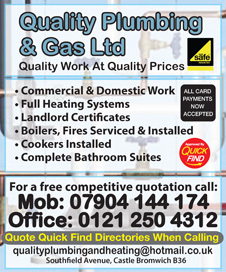 Quality Plumbing and Gas Ltd are a local gas safe registered business, vetted and approved by Quick Find directories. Covering Sutton Coldfield, Streetly, Great Barr, Erdington, Castle Bromwich and surrounding areas. "Came out to repair my boiler after having two other engineers out. The engineer spotted the fault straight away and got me up and running again within a hour. A lovely polite young man who obviously new what he was doing. I wouldn't hesitate to call him again or recommend him to my friends"
"This company (Dan Willis-Owner) fitted a Worcester boiler / 1 Rad / 7 Rad thermostats & a new larger gas pipe. Carpets & floorboards up / boxing in the pipes and tiling was all done to a top standard. No looking for extra work when he came to give us a quote or during the job to up the price. The quote was that good we did not bother getting any other quotes. NO MONEY changed hands until the system was fully working and we were happy. You can trust this company and we will tell our friends & family the same." "Danny Fitted full central heating system for us, He did a fantastic job from start to finish , you would not even know he was there and very tidy worker , I have recommended him to family and friends and they are just as satisfied with his work . My Advice if you need work done DANNYS THE MAN TO CALL usually i get 3 Quotes you wont need to with Danny just call him and you wont be disapointed"